The Orontes (/əˈrɒntiːz/; Ancient Greek: Ὀρόντης) or Assi (Arabic: العاصي‎, ‘Āṣī; Turkish: Asi) is a northward-flowing river which begins in Lebanon and flows through Syria and Turkey before entering the Mediterranean Sea. In ancient times, it was the chief river of the Levant region and the site of several major battles. On it was the classical city of Antioch on the Orontes (Syrian Antioch) near modern day Antakya. In the 9th century BCE, the ancient Assyrians referred to the river as Arantu, and the nearby Egyptians called it Araunti. The etymology of the name is unknown, yet some sources indicate that it might be derived from "Arnt" which means "lioness" in Syriac languages;[note 1] others called it "Alimas", a "water goddess" in Aramaic. However, Arantu gradually became "Orontes" in Greek. In contrast, Macedonian settlers in Apamea named it the Axius, after a Macedonian river god. The modern name ‘Āṣī (or Asi) is derived from the ancient Axius. The word coincidentally means "rebel" in Arabic, which folk etymology ascribes to the fact that the river flows from the south to the north unlike the rest of the rivers in the region. The Greek geographer Strabo refers to the river in the Geographica (circa 20 CE). According to Strabo, the river was originally named Typhon, because it was said that Zeus had struck the dragon Typhon down from the sky with thunder, and the river had formed where Typhon's body had fallen. He writes that the river was later renamed Orontes when a man named Orontes built a bridge on it. The Orontes rises in the springs near Labweh in Lebanon on the east side of the Beqaa Valley (in the Beqaa Governorate) between Mount Lebanon on the west and the Anti-Lebanon Mountains on the east, very near the source of the southward-flowing Litani, and runs north, falling 600 metres (2,000 ft) through a gorge to leave the valley. The Ain ez Zarqa is one such major spring. Other major springs are Al Ghab, Al Rouj, and Al-Azraq. Leaving this gorge, it expands into the Lake of Homs in Syria (an artificial lake created by a Roman-era dam, also known as Qattinah lake) and through the city of Homs (or Ḥimṣ). Below is the district of Hamah (Hamaih-Epiphaneia), and the ancient site of Larissa (Shaizar). This is where the river enters the Ghab plain. Further downstream, on the eastern edge of the Ghab, is located the ancient city of Apamea. To the west is the Coastal Mountain Range. This section ends at the rocky barrier of Jisr al-Hadid, where the river turns west into the plain of Antioch (Amik Valley) in Turkey. Two major tributaries are the southward flowing Afrin on the west and Karasu on the east join it through the former Lake of Antioch now via an artificial channel (Nahr al-Kowsit). Passing north of the modern Antakya (ancient Antioch) the Orontes dives southwest into a gorge (compared by the ancients to Tempe), and falls 50 metres (160 ft) in 16 kilometres (9.9 mi) to the sea just south of Samandağ (former Suedia, in antiquity Seleucia Pieria), after a total course of 450 kilometres (280 mi). Map of the Orontes river. White lines are country borders, river names are italic on a blue background, current cities or major towns have white backgrounds, orange background for other places of significance. 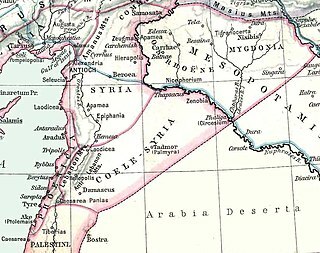 The Orontes is not easily navigable and the valley derives its historical importance as a road for north/south traffic; from Antioch south to Homs and thence to Damascus via Al-Nabek (An-Nabk). On the Orontes was fought the major Battle of Kadesh (circa 1274 BCE) between the Egyptian army of Ramesses II from the south and the Hittite army of Muwatalli II from the north. The river was also the site of the Battle of Qarqar fought in 853 BCE, when the army of Assyria, led by king Shalmaneser III, encountered an allied army of 12 kings led by Hadadezer of Damascus. In 637 CE the Battle of Iron bridge was fought between the forces of the Rashidun Caliphate and the Byzantine Empire near the Iron bridge on the river made by Romans. The Orontes has long been a boundary marker. For the Egyptians it marked the northern extremity of Amurru, east of Phoenicia. For the Crusaders in the 12th century, the Orontes River became the permanent boundary between the Principality of Antioch and that of Aleppo. Pliny the Elder mentioned a tributary of the Orontes as Marsyas river (named after Marsyas). The same tributary was drawn by Richard Pococke to the east of the Orontes in the Al-Ghab plain near Apamea. Other derivation of the river's name is Mimas, as known in Homs, named after Deir Mimas in honor of Saint Mamas. The French writer Maurice Barrès (1862–1923) wrote about the river in his Un Jardin sur l'Oronte. Tell Tayinat and Tell Atchana - archaeological sites near each other in Hatay. Qatna - ancient city near Homs. Kadesh (Syria) - ancient city, later known as Laodicea ad Libanum. Baalbek - a town and archaeological site just to the south of the source of the Orontes. ^ The source of the river Orontes is the village, Labweh, which also means a "lioness". ^ a b c d e f g h i "Asi-Orontes Basin". Food and Agriculture Organization of the United Names. 2016. Retrieved 18 March 2018. ^ a b Gaston Maspero. History of Egypt, Chaldæa, Syria, Babylonia and Assyria (Complete). p. 1348. ^ Ballabio, R.; Comair, F.G.; Scalet, M.; Scoullos, M. (2015). Science diplomacy and transboundary water management: the Orontes River case. UNESCO Publishing. p. 89. ISBN 9789230000172. ^ Fitchett, Joseph; Deford, McAdams (1973). "A River Called Rebel". Aramco World (May/June): 12–21. Retrieved 15 February 2015. ^ Getzel M. Cohen. The Hellenistic Settlements in Syria, the Red Sea Basin, and North Africa. p. 100. ^ a b "LacusCurtius • Strabo's Geography — Book XVI Chapter 2". penelope.uchicago.edu. Retrieved 2017-02-03. ^ Nonnos of Panopolis (20 July 2015). Delphi Complete Dionysiaca of Nonnus (Illustrated). Delphi Classics. pp. book 17. ^ Scheffel, Richard L.; Wernet, Susan J., eds. (1980). Natural Wonders of the World. United States of America: Reader's Digest Association, Inc. p. 34. ISBN 0-89577-087-3. ^ "Marsyas". Dictionary of Greek and Roman Geography. ^ Richard Pococke (1743). A description of the East, and some other countries Vol. II. William Bowyer. p. 140. ^ عمر فاروق الطباع (2016). ديوان البحتري 1/2 Diwan of Buhturi (in Arabic). Beirut: دار الارقم بن ابي الارقم. p. 169. ^ مصطفى الصوفي (2017). طقوس احتفالات المواسم والأعياد الربيعية (in Arabic). ktab INC.
^ Barrès, Maurice (1922). Un jardin sur l'Oronte. Paris. This article incorporates text from a publication now in the public domain: Chisholm, Hugh, ed. (1911). "Orontes" . Encyclopædia Britannica (11th ed.). Cambridge University Press. Pop-up map of the Orontes River available at: "Trace elements concentration in sediments of Orontes River using PIXE technique". Nuclear Instruments and Methods in Physics Research Section B: Beam Interactions with Materials and Atoms. 269: 1818–1821. doi:10.1016/j.nimb.2011.05.006. Map of the Orontes River Basin: "Inventory of Shared Water Resources in Western Asia: Orontes Basin" (PDF). United Nations. 2012. Retrieved 21 March 2018. Antakya is the seat of the Hatay Province in southern Turkey. Coele-Syria, Coele Syria, Coelesyria, also rendered as Coelosyria and Celesyria, otherwise Hollow Syria, was a region of Syria in classical antiquity. It probably derived from the Aramaic for all of the region of Syria but more often was applied to the Beqaa Valley between the Lebanon and Anti-Lebanon mountain ranges. 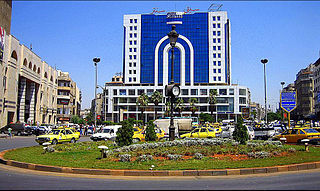 The area now forms part of the modern nations of Lebanon and Syria. Apamea, on the right bank of the Orontes River, was an ancient Greek and Roman city. It was the capital of Apamene under the Macedonians, became the capital and Metropolitan Archbishopric of late Roman province Syria Secunda, again in the crusader time and since the 20th century a quadruple Catholic titular see. Laodicea ad Libanum, also transliterated as Laodiceia or Laodikeia; also Cabrosa, Scabrosa and Cabiosa Laodiceia – was an ancient Hellenistic city on the Orontes in Coele-Syria, the remains of which are found approximately 25 km southwest of Homs, Syria. The city is mentioned by Strabo as the commencement of the Marsyas Campus, which extended along the west side of the Orontes, near its source. It is called Cabiosa Laodiceia by Ptolemy, and gives its name to a district Laodicene (Laodikênê), in which he places two other towns, Paradisus (Paradeisos) and Jabruda (Iabmouda). Pliny, among other people of Syria, reckons ad orientem Laodicenos, qui ad Libanum cognominantur. Antigonia also transliterated as Antigonea and Antigoneia was a Hellenistic city in Seleucid Empire, Syria, on the Orontes, founded by Antigonus I Monophthalmus in 307 BC, and intended to be the capital of his empire; the site is approximately 7 km northeast of Antakya, Hatay Province, Turkey. After the Battle of Ipsus, 301 BC, in which Antigonus perished, the inhabitants of Antigonia were removed by his successful rival Seleucus I Nicator to the city of Antioch, which Seleucus founded a little lower down the river. Diodorus erroneously says that the inhabitants were removed to Seleucia Pieria. Antigonia continued, however, to exist, and is mentioned in the war with the Parthians after the defeat of Crassus. Mahardah, also spelled Mhardeh or Muhardah, is a city in northern Syria, administratively part of the Hama Governorate, located about 23 kilometers northwest of Hama. It is situated along the Orontes River, near the Ghab plain. Nearby localities include Halfaya and Taybat al-Imam to the east, Khitab to the southeast, Maarzaf to the south, Asilah and Jubb Ramlah to the southwest, Shaizar, Safsafiyah, Tremseh and Kafr Hud to the west and Kafr Zita and al-Lataminah to the north. ar-Rastan is the third largest city in the Homs Governorate, located 25 kilometers (16 mi) north of its administrative capital Homs and 22 kilometers (14 mi) from Hama. Nearby localities include Talbiseh and al-Ghantu to the south, al-Zaafaraniyah and al-Mashrafah to the southeast, Murayj al-Durr to the northeast, Tumin to the north, Deir al-Fardis to the northwest and Kafr Nan and the Houla village cluster to the west. Ar-Rastan had a population of nearly 40,000 in 2004. The Ghab Plain is a fertile depression lying mainly in the Al-Suqaylabiyah District in northwest Syria. The Orontes River, flowing north, enters the Plain near Muhradah, around 25 km north-west of Hama. Tal Salhab is a town in the western center of Syria, administratively part of the Hama Governorate, located 48 kilometres (30 mi) northwest of Hama. It is situated on the southern edge of the Ghab plain and by the western bank of the Orontes River. Nearby localities include Nahr al-Bared, Asharnah and al-Suqaylabiyah to the north, Deir Shamil and Deir Mama to the south, Tremseh, Mhardeh and Halfaya to the east. Qarqur is a village in northern Syria, administratively part of the Hama Governorate, located northwest of Hama. It is situated in the al-Ghab plain, on the eastern bank of the Orontes River. Nearby localities include Jisr al-Shughur 6 kilometers to the north, Farikah to the northeast, Qastun to the southeast, al-Ziyarah 7 kilometers to the south, Sirmaniyah to the southwest and al-Najiyah to the northwest. According to the Syria Central Bureau of Statistics, Qarqur had a population of 2,356 in the 2004 census, making it the largest locality in the al-Ziyarah sub-district (nahiyah). Zita al-Gharbiyah is a village in central Syria, administratively part of the Homs Governorate, located southwest of Homs and immediately north of the border with Lebanon. Nearby localities include Aqrabiyah to the north, Kadesh and Arjoun to the northeast, the district center of al-Qusayr to the east and Jusiyah al-Amar to the southeast. According to the Central Bureau of Statistics (CBS), Zita al-Gharbiyah had a population of 2,922 in the 2004 census. The population is predominantly Shia Muslim and is immediately surrounded by several smaller Shia Muslim villages. Although the village is in Syria, its inhabitants are Lebanese. Tell al-Nabi Mando, known in archaeological literature as Tell Nebi Mend and also known as Qadesh after the Bronze-Age city which stood at almost the same location, is a village in central Syria, administratively part of the Homs Governorate, located southwest of Homs. It is situated on the eastern banks of the Orontes River. Nearby localities include al-Houz to the north, Kafr Mousa to the northeast, Arjoun to the east, al-Qusayr to the southeast, Zita al-Gharbiyah to the southwest, al-Aqrabiyah to the southwest and al-Naim to the northwest. According to the Syria Central Bureau of Statistics (CBS), Tell al-Nabi Mando had a population of 1,068 in the 2004 census. The village is adjacent to the ancient site of Qadesh, a name sometimes also used for the village, which abuts it to the north. It is an Alawite village. Malatius Jibriel Jaghnoon,, is a Syrian engineer and epigrapher specialized in Aramaic and Greek inscriptions.